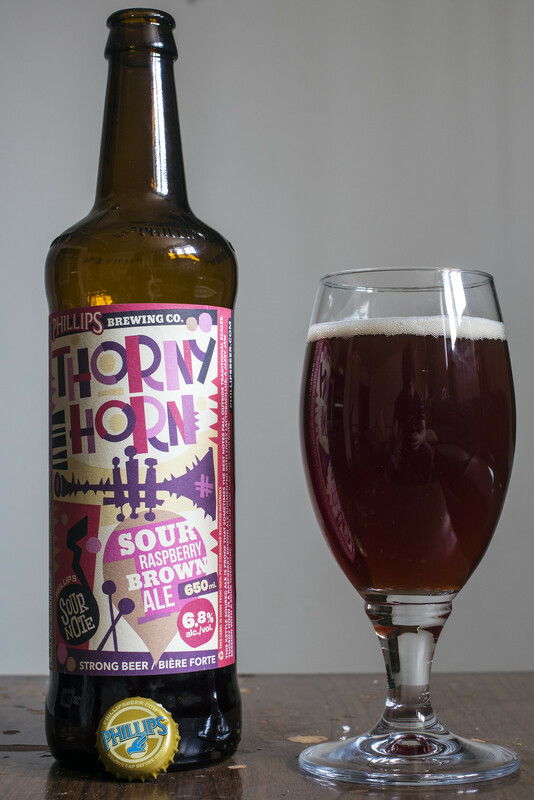 Phillips Brewing's Thorny Horn Sour Raspberry Brown Ale is the very first beer released as part of Phillips' Sour Note series of Sour beers. Description of the beer: "Pucker up and play the sour note! The first ever release from our Sour Note series takes an encore this week. This tasty sour is born as a medium bodied brown ale and fermented with a saison yeast. Following this, it is infused with raspberries and augmented with a lively Lactobacillus bacteria, the magical secret to sour. Like all of our special sour note releases, this brew features our own ‘lacto’ strain that was culturedin-house from our spent grain. A tangy berry nose leads to a rich, slightly sharp raspberry tartness through the body that finishes puckeringly dry." It's been a while since I've reviewed a sour, so here we go! Appearance: Pours a dark reddish cherrywood with a hint of clarity to it but it's dark enough that you just can't quite see through the beer. Moderate amount of beige head on top that gradually diminishes and leaves behind a bit of foam mostly around the edge of the glass. Aroma: Not as sour as I was expecting. I get notes of fresh made raspberry juice, a bit of a classic brown ale aroma to it.. meaning that it has a bit of a nuttiness and caramel scents in there as well. As for the sour notes we are supposed to expect in this beer - it has a light bit of tart fruit like cassis or a tamed version of a sour cherry. Light amount of floral and grassy hops near the end. Really liking the fresh raspberry notes so far. Taste: Thankfully this beer is a bit more tart than the aroma as I'm getting a bit of a light sharpness that's reminiscent of a red wine. The raspberry fruitiness is pretty lingering and still pretty decent - I'm liking that it doesn't have that faux syrupy taste to it like most raspberry ales have.. it tastes natural! The beer actually reminds me of raspberry pie, I get ever such a smidge of creaminess in there and a bit of a good homemade graham pie crust doughiness in there as well. The sour notes also give off a bit of an earthy profile to it as it warms up a bit. Overall Thoughts: I was hoping for face puckering in this sour and I'm disappointed in that. That being said, this is a solid fruit beer. It shows off the raspberries a great deal, it's mildly tart and mostly reminiscent of a light amount of a tarty fruit like cassis. It's easy to drink and could work in any season in my opinion - Summer on the patio or winter by the bon fire.